The first question you have to ask yourself, was golf ever fun? If you answered no then pack it up right now because this game is not going to change your opinion in any way. If you've liked the yearly PGA tour games than Golf is the incredibly minimalist, but fully functional version of that series. 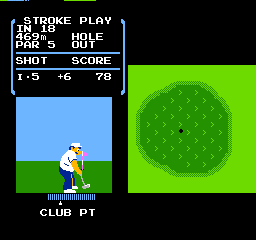 I can't stress enough how much you have to "like" the idea of playing golf to enjoy this or any of the NES golf titles. One thing I appreciate about this game is that very little comes down to chance in this game. The biggest variable is wind, but anything under 10m isn't likely to change your approach that much. Please look at a manual before you give up on Golf for the NES. It explains a lot about the clubs in the game and even informs you how far each club will drive on the green and in a bunker. Combine that knowledge with the distance to the hole and you have a much better idea at how to approach a course. Without the manual, you're in for a rough time of guessing what might work and then resetting when it doesn't. There are five factors in your control and two outside of your control. These seven features make up nearly the entire game and it's kind of beautiful that Golf could be that simple while offering a lot of variety. You control your club, your swing, the force of your swing, and your putt. The game controls the wind and the obstacles (courses). Again, it's simple, but beating your high score is rewarding. Two other golf games came out in Japan around the same time. While both of those options are less optimized than Nintendo's version it is suspect that they all use an identical approach to simulating golf in a video game. The important thing about Golf on the NES is that it was the most successful title of the three and paved the way for all future 2D golf games. And while Golf has moved on to bigger and better things in the 3D space, the core concepts of what should matter in Golf (Club, Swing, Force, Wind, and Putt) have all carried over and with very little change. That's quite a notable difference compared to how drastically different 10-Yard Fight is to Madden '18. Also, we have to note that legendary composer Koji Kondo (Legend of Zelda Series) and Shigeru Miyamoto (Super Mario Bros. and Legend of Zelda) were both the composer and designer respectively on Golf. THE VERDICT: Golf is so much more fun than it has any right to be. It's kind of amazing how similar Golf games are today when compared to this 1985 (1984 in Japan) Golf game. Sure, new games have more features, but does that make them better? There is beauty in the simplicity of this game. We can't say it's essential, but we have to recommend giving it a go. Play it! Humbly showing of my best game of Golf after roughly ten hours of playing the game.